If you follow a vegetarian, pescatarian, or vegan diet then you’re in good company. According to research published in April 2018 by comparethemarket, 3.5 million people now define themselves as vegan – equating to 7% of the British population – while the NHS states that more than 1.2 million Brits are vegetarian. Flexitarianism (eating predominantly, but not strictly, vegetarian), pescatarians, and meat reducers are also on the rise with the likes of #MeatFreeMonday, the campaign launched by Stella and Paul McCartney, now taking over our social feeds every week. Industry experts have suggested this shift to plant-based, dairy-free and meat-free living is largely down to a combination of environmental concerns, demand for healthier ingredients, better quality foods, and greater variety. The researchers at Kantar have also pointed to the use of veganism and vegetarianism as a status symbol; representing an aspirational lifestyle. And our changing diets have given budding entrepreneurs food for thought, with a number of exciting and innovative start-ups launched to capture opportunities surrounding vegan, veggie and pescatarian food. The Goodness Project offers a subscription box service for vegan, natural, and gluten-free products. Working with a variety of brands including The Raw Chocolate Co, Nakd, Yogi Tea, Ombar, Creative Nature, PROPERCORN and more, the start-up delivers quality, healthy food and gifts direct to your home or office. The start-up was the exclusive online retailer of Diageo’s Baileys Almande, the dairy-free, gluten-free, and vegan version of the standard product, and it has over 2,000 customers and growing. If The Goodness Project takes your fancy or you want to send a box to a friend, then the start-up can even add handwritten gift cards or can personalise the box for you. Vegan indulgence at its finest; The Vurger Co dishes up 100% plant-based burgers from its full-service restaurant in Shoreditch, London. Its burgers are made from vegetables, seeds, nuts, grains and legumes and are anything but “dry, tasteless or boring”. 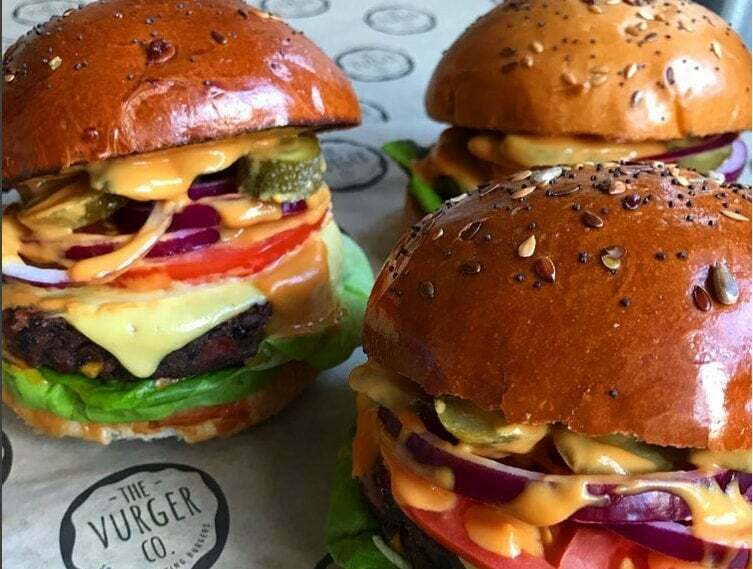 Having originally started out as a street food business, The Vurger Co opened its restaurant doors in March and already boasts a 4.5 star TripAdvisor rating with swarms of social followers (29,000 on its Instagram alone). From the Auburger; a burger patty made from aubergine, caramelised onion and tabasco chipotle chickpea, to the Holy Habanero;a spicy corn fritter with tortilla chips and spiced almonds, you’re guaranteed healthier fast food that tastes as good as it looks (see main photo!). Mindful Chef is the only meal subscription box service in the UK catering to every diet, so that you can have access to fresh, sustainably-sourced ingredients. With meal recipes that cater for vegans and vegetarians to pescetarians and meat-eaters, Mindful Chef has also eschewed gluten, dairy and refined carbs from all of its recipe boxes. 20,000 Brits are fans of the service while sporting royalty Victoria Pendleton CBE and Sir Andy Murray have also given their support, participating in a £1m crowdfunding round to help the start-up scale with Pendleton calling it “quite simply, the best recipe box you can buy”. And, from just £4 per meal, the start-up’s healthy food boxes promise to give you everything you need to make delicious, low-carb evening meals. Healthy snacking is made easy with Well & Truly. The creators of snacks that don’t compromise flavour for health credentials, Well & Truly offers a range of loaded tortilla chips and crunchy corn snacks in cheese, smokey paprika and sour cream flavours. The range uses all-natural ingredients, is gluten-free with no-added sugar, and the snacks have 40% lower fat than traditional variants. Stocked in 1,500 stores nationwide with retailers such as Tesco, Wholefoods, Ocado, and Sourced Market, you can also get your hands on the start-up’s products via its website so that you can “say no to guilty pleasures and sad snacking with real satisfaction”. ‘Healthy’ and ‘pot noodle’ don’t normally belong in the same sentence together but Mr Lee’s Noodles has made that a reality. The start-up is the creator of gourmet healthy pot noodles that are gluten-free with no MSG’s, artificial preservatives, additives, flavourings or colourings, and are said to be the lowest in salt, sugar, calories, and fats on the market. With vegan options available including dragon fire and zen garden vegetables, alongside flavours such as miso, curry, and tom yum, the start-up says it’s able to maintain the physical and nutritional integrity of its products by using freeze-dried ingredients instead of dehydrated. You can shop for Mr Lee’s Noodles online via its website and via Ocado and Amazon. Forget heading to Pret, Costa, or your local supermarket to grab an office lunch, Feedr makes getting healthy fast food at work simple and easy. The start-up enables your company to order in delicious and healthy artisan food to be delivered straight to your desk. Targeted at companies of between five and 1,000 employees that typically don’t have their own in-house canteen, Feedr provides a virtual canteen service so you can pick and purchase meals from a daily rotation menu of healthy options. You can order in plant-based meals from Deliciously Ella, get root-based salads from Gail’s Bakery, or get a tasty seafood dish from Enrica Rocca. The start-up also has charitable credentials – it donates one healthy meal to a school in India for every meal ordered. Enjoyed this read? Take a look at our Startups 100 2018 index in full here – sponsored by DCMN with Making Moves London as event partner – to view more game-changing start-ups, food and drink businesses, and innovations!